Social login is the new trend that is booming over the web and helping various businesses boost their conversion rates by encouraging the users to engage with their services. This login type refers to the registration of users with their existing identities on different social networking sites so that the businesses can have valuable permission-based data about the users. Social login allows the users to access a number of business websites with their social identities such as from Facebook, LinkedIn, Google+ and Twitter. Effortless login from these platforms helps the users avoid the registration requirements that they need to perform while accessing a website on their own. From business’s point point of view, login from social network sites allows the marketers to compile accurate users’data including verified email address, gender, age, relationship status and other related information. The easy sign in procedure to different platforms from a single social identity also wipes out the requirement of remembering the passwords for each site as your Facebook or Twitter identity is enough to visit various sites from any corner of the world. Studies have shown that the users are not likely to create a separate login to check out different websites. They find it a boring option to create the id and remember a whole set of new passwords. This puts the user off from logging in to the new website and shifts their attention to the destinations that do not insist on traditional registration alone. Visitors to a particular website correlate to the revenue generation of the business. Enterprises continuously require the engagement of the new users even after having a huge client base. Moreover, if the registration process is shifting the users to competitors’ websites, it is good to find the alternative in the form of social login to keep them intact with the business. People visit business websites in order to check out the deals they are interested in. Thus, it is not a wise move to make it harder for them to get connected to the site with a whole new set of user id and password. Business are required to make things go smooth while increasing the conversion rates through guest visits. Facebook is mostly preferred by the users when signing in to websites that ask for users’ identity. Google+ comes at the second place followed by Twitter and LinkedIn logins. Having a single login for a number of services is extremely convenient for the users to remember. The one login id of any social networking platform reduces the users’ frustration and provides a better user experience. Forced registration never ends up in a successful user visit. Studies have shown that such a registration would cause the abandoned purchasing actions from the end of users. The main selling point of social networking platforms is the promotion of brands among friends, family members, and other known people. It is an ideal phenomenon for businesses to promote their brands through different social logins. When users sign up using their social networking accounts, the site owner can get the access of their profiles. This helps the owners to personalize the product suggestions based on the users’ social graph. A number of users login to social networking accounts with fake user IDs. Some of the users also control their privacy settings encompassing birth date, gender, and other personal information and can also restrict the access of this crucial information. This may cause compilation of inaccurate or incomplete data to the business owners. Social login is a great medium when it comes to remaining in touch with the friends. However, the idea of sharing all the personal information over any of the popular platforms does not suit to a number of users. This restricts the access of any kind of information from users’ profile. Remembering the username and password for eCommerce sites that are used frequently causes confusion for the users. Instead of allowing the users to just remember their login details, some eCommerce sites require them to remember login options they used in the first place. Believe it or not, some people do not use social login platforms. Thus, the companies relying only on these platforms are completely ignoring the people who are not registered anywhere with any of the social login platforms. Consumers actual behavior over social networking platforms cannot be predicted; however, they are the ones who are not going to give a second chance to online merchants. Personalized customer service is the key to success for brands. In case you are an online merchant, you need to ensure a great user experience to cater the fickle mind of the consumers and for the purpose, social login can be the best solution. Consumers do have a liking for social login as it is an easy medium to sneak peek to eCommerce websites that ask for separate registration from the users. Among all the social login platforms, Facebook is one that sufficiently helps the users to visit different sides with a single ID, which is, of course, a convenience to them. This makes social login options preferable to the users as well as to online merchants. This article is written by Tom Hardy. Being a passionate writer and top-notch developer at Sparx IT Solutions - eCcommerce Web Development Company, he keeps up with the latest trends in the eCommerce market and makes people aware of the new trends & technologies through various blogs and articles. Great article! 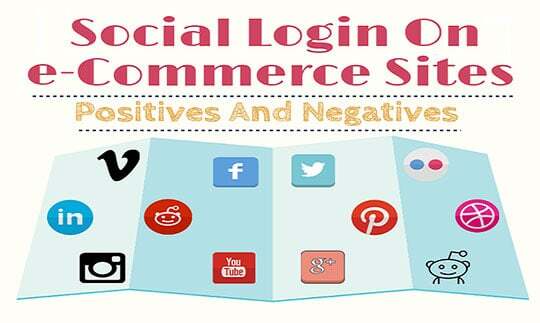 Social login is the best solution for e-commerce sites. Nowadays social sites engagement is increasing day by day so it’s a good resource for new and existing clients/ users.